Morocco used to be a ‘transit country’ for migrants – one through which they would pass on their way to Europe. Now, more and more migrants are settling in Morocco. Europe wants Morocco to be a ‘guardian’ so the migrants stay there. Since January the authorities have made more and more efforts to integrate migrants into Morocco. Caritas has played a part in this. For example, we’ve encouraged all schools – both state and private – to take migrant children. Before, children would have to know the Koran to be accepted into a school. For children who aren’t Muslim, this would be a challenge. The Church in Morocco has managed to bring about a change so children no longer need to know the Koran to get an education if they’re not Muslim. 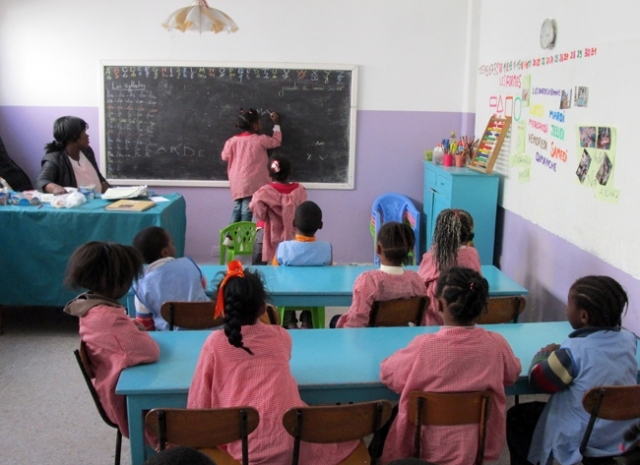 At Caritas in Rabat we provide children, including migrants, with pre-school education until they’re six. However, It’s difficult to arrange education, training and a job for adolescents who are migrants and to help secure them a future. Migrants are coming in their thousands to the Spanish enclaves of Ceuta and Melilla in an attempt to get to Europe. About half of them get across. Caritas helps them with advice and also medical attention if they need it. The migrants I’ve met are driven by incredible spiritual and human strength. Sometimes the migrants come to me before trying to scale the massive fences at the enclaves. They say to me ‘Bless me because we’re going across’. Even after failing to cross over ten times they try again. One of the reasons why they’re so determined is that they can’t go back home empty handed. Many of their families have gone into debt to help pay for their journey. Many migrants aren’t poverty-stricken or uneducated. They have diplomas, some are even doctors. There are driven to despair by the lack of opportunities in their countries. The life of the migrant is a story of human rights. They can’t live decently and have a dignified life in their country so they leave. Many migrants from North Africa pass through Italy. Italy is doing a magnificent job dealing with the large numbers arriving. However, we remain a Europe with some egotistical countries. Some people say that Europe isn’t responding well to the large number of migrants arriving because it’s in crisis. I would say, yes, it is in crisis: in a crisis of selfishness. This is just the beginning regarding the migration story. The international community needs to work on development in countries where people migrate from. The West needs to open its eyes to the issue and to not respond by building walls.